Keystone Students Display Talent Teachers at Keystone Elementary, Middle and High School submitted some of their students best works for judging in the Keystone Pointe Art Show on April 21st. The students did a wonderful job with their art work and the choice of winners was hard. 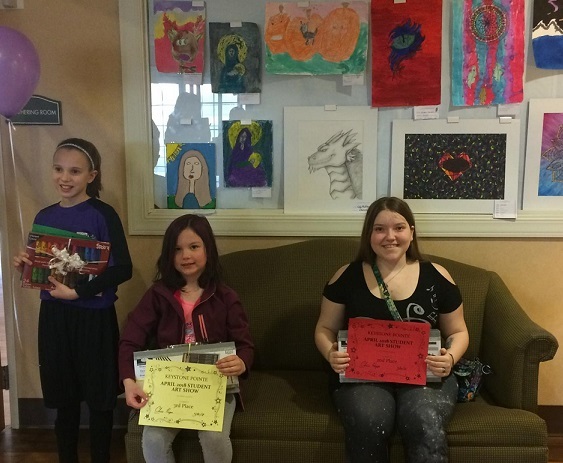 Winners of the contest were Alexa Olic who won first place, Trinity Pfeifer in 11th grade who won 2nd place, 1st grader Corinne Lamp who won 3rd place and 2 runner ups, Gabby Hagerman in 5th grade and Peyton Lunn in 7th grade. Community members, visitors, staff and residents of Keystone Pointe voted for the winners. One visitor at Keystone Pointe remarked, 'The talent of all the students in the show is amazing, I couldn't imagine creating work half as nice'.